You brew beer, you brew coffee, you brew tea, but you don't brew cider. You just have to make it. Cider has the alcohol content of a beer, but it's made like a wine. It exists in the in-between of having the carbonation and alcohol by volume of brews but with the essential ingredients and simplicity of wine. But for semantics' sake, categorically and legally, it is a wine. Made only from pressed apples (or pears) and yeast, when the fermentation process of cider is completed, it is usually dry and sits around 6 to 7 percent ABV. Ciders can be back-sweetened after fermenting with more apple juice to yield sweeter results or with other fruit juices to adjust the color and flavor profile of the drink. And ciders are rising in popularity in the Charlotte area. Over the past few years, Charlotteans have begun opening their palates to this potion of fermented apples, and breweries and restaurants have taken notice, many of them setting aside a tap or two reserved solely for cider. Because Charlotte is a city that prides itself on locality and its focus on small businesses and Charlotte-based operations, cideries like Good Road Ciderworks and Red Clay Ciderworks have demanded the attention of Charlotteans. A beautiful array of ciders from Red Clay Ciderworks. While most hold the misconception that cider is a sickly sweet drink, Jay Bradish, owner of Red Clay, and Brian Beauchemin, owner of Good Road, work to churn out batches of true cider that don't make customers balk at the overwhelming sweetness and provide a little something for everybody's palate. "If you can get somebody to try something here, and their only experience is [New York-based cider company] Angry Orchard, and they hated it because it was so sweet, it's hard getting that person to try something here. But once you do, we almost always have something that appeals to them," Bradish stated. "We have a couple on the sweeter end and more than half of those are in the semi-dry to dry [range]." Beauchemin and Bradish both have a background of homebrewing and fermenting their own libations. Bradish was stationed in Sicily when his interest in making wine began. After returning stateside in 1997, he decided to begin making apple wine with his wife at her parents' home in Michigan. The two apple trees in the front yard provided them with an opportunity, and they took it to turn apples into 10 gallons of apple wine in 1999. With a case and a half of apple wine in tow, they moved to Charlotte in 2000. Bradish isn't sure what happened — whether it was the bustling move or the warmer climate here in the South — but the wine re-fermented. This resulted in a carbonated drink, very similar to a cider. So they continued playing with that process, eventually opening Red Clay in July 2015. "We did that for several years but people kept drinking it more like a beer because it was really refreshing, but it was 12 percent so it wasn't very compatible for pounding it like a beer," Bradish said. Instead of back-sweetening the cider, which raises the alcohol content, he decided to skip that step so the cider would result in a lower ABV, birthing the recipes that Red Clay uses today, like Red Clay's Queen City Common and The South End ciders. 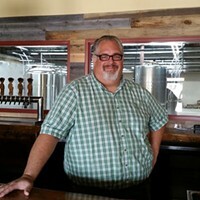 Brian Beauchemin, owner of Good Road Ciderworks. Beauchemin started in 1994 as a homebrewer before he first tried making a cider about 10 years ago. After creating an English dry cider, he fell in love. Beauchemin and his wife knew that they wanted to be in the craft industry and saw that Charlotte's rise in craft beer left much to be desired in the cider category. 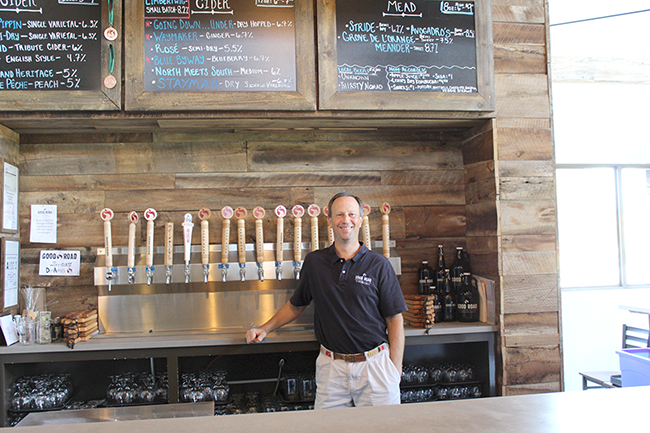 With only one other cidery in town, Red Clay, Beauchemin and his wife saw the opportunity to join the craft industry and opened Good Road in March 2017. "We looked at a couple different things, and of course a brewery was always an option, but we decided to do something different," Beauchemin said. "The rise of cider was just starting to take off, studies have shown it's probably about four or five years behind the beer market. 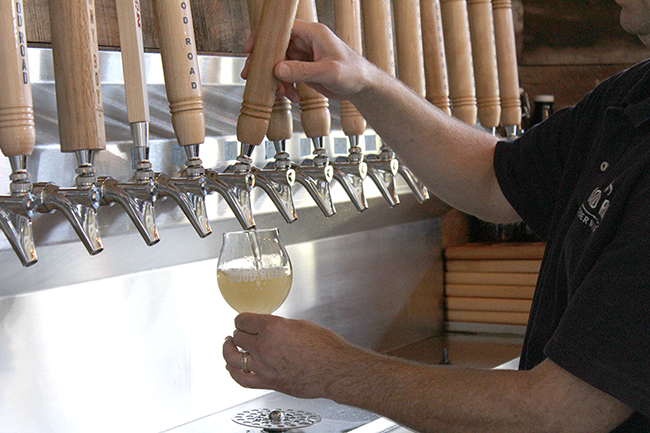 So we thought that the timing was good to make an entrée into the cider world." Good Road is a play on Beauchemin's family name. A translation of the French family name means "beautiful path," but he believed that morphing it into Good Road sounded better. The stories of the two cideries are similar, but the focus of the two are markedly different. Red Clay ventures out into the fruited cider varieties and puts out crafts such as jalapeño-and-pineapple-infused cider and a watermelon with cucumber cider. But Bradish still keeps the core Queen City Common and The South End flagships that are "straight-up apple ciders." On the other hand, Beauchemin focuses on the apples. Single varietals and apple blends that draw their flavor profiles from certain types of apples dominate the tap list. He hardly back-sweetens them with another fruit, but you can still taste the difference between the hard apple ciders. For example, the very popular flagship Newtown Pippin is 6.3 percent ABV and has a lemon-y and acidic taste to it while hanging dry on the tongue. The Limbertwig settles in at a whopping 8.2 percent, is apple-forward and reminiscent of a pinot grigio. But Good Road still dabbles in the fruited flavors, with blueberry ciders, flavored meads and barrel programs to infuse flavors of dark liquors in the drink. Last year, Good Road created a cranberry cider and aged it in a rum barrel, which Beauchemin said reminded him of his college and post-grad go-to mixed drink, cranberry juice and rum. When referencing cider, it's important to discuss the variety of apples that contribute to the different flavor profiles. While there are approximately 2,500 apple varieties in the United States, Beauchemin explained what a true cider apple is. They're called "bittersweets," and with the high levels of tannins that occur naturally in the skins of fruits like grapes, pears and apples, consumed raw leaves a bitter taste in the mouth, he said. "But when they are pressed and fermented they make wonderful ciders," Beauchemin added. 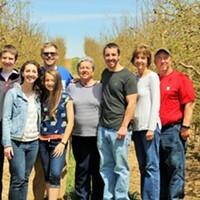 Good Road sources its cider apples from Perry Lowe Orchards in Taylorsville (see page 12), but also has forged relationships with orchards in Virginia, Michigan and New Hampshire. 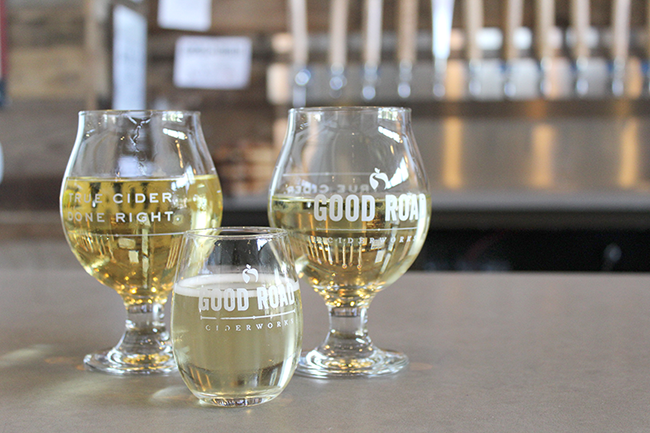 The variety of cider apples in New Hampshire brings the New England-style flavors in Good Road's North Meets South cider. Red Clay sources apple juice from the Bradishes' home state of Michigan when needed and from orcahrds in Hendersonville and western Lincoln County. 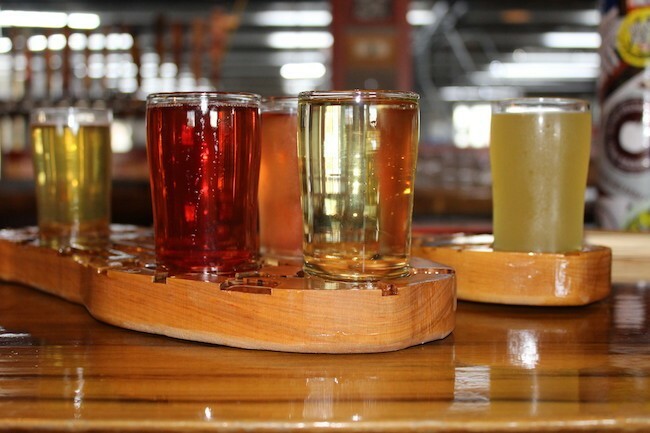 Two flights of cider on custom-made flight paddles at Red Clay. This past year, Mother Nature has affected the cider apple yield in North and South Carolina orchards. Bradish saw these affects in his own cidery, as he had to source most of his apples from Michigan, the apple blossom state. "As it keeps getting warmer, it's harder down here in North Carolina because everything is so dependent on us not having a warm mid-winter," he stated. "And the past couple of years, it has not been an easy time for growers for sure." It's important for apples to be picked at certain times, when the composition is optimal. Beauchemin wants pressed apples when they're harvested at the right time, but weather is always affecting this. "In a perfect world, we would like apples picked when the sugar content is at its highest and that doesn't always mesh with the orchard growers. 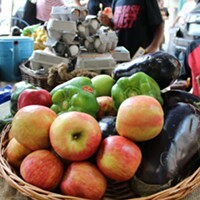 They have to make a living, and they'll make a lot of money selling whole apples to the public," Beauchemin stated. "So it's that balance of working with the orchard growers with what Mother Nature has given them." He continued, stating that when hail storms hit orchards, the apples are left with brownish welts on them, making them unsellable to the public. Cider makers are happy to take wholesale apples with some bruises on them and press them, as appearances only matter in the final product. But weather that affects the harvest of apples also affects the taste, so small shifts in the final product of year-round ciders occur. "Our first batch of Newtown Pippin, which was from the 2016 harvest, was pineapple [with] spicy notes and low acidity," Beauchemin said. "Last year's was very citrus-forward, heavy on the lemon, high acidity. Same apples from the same orchard, it's just based on the weather that Mother Nature gave us. Same yeast, same process, so the only thing that has really changed is the harvest and what those apples have gone through in that time." Cider-happy drinkers may notice this taste if they've been swimming in the apple cider scene. 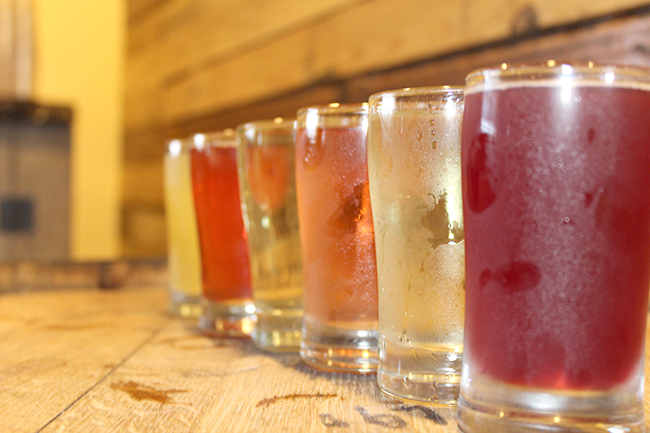 The rise in popularity of cider in Charlotte created a culture, much like the yeast Bradish and Beauchemin add in their apple juices, resulting in flowing delicious cider. Both cidery owners attribute the newfound interest in the drink to a change in the population's curiosity of options and diets. "We definitely capture people that don't like beer at all, and people that need to be gluten-free or are choosing to be gluten-free," Bradish said. Whether someone is looking for a lower alcohol content in their drink of choice with a lighter mouthfeel, or wants to change their diet for medical or personal reasons, cider seems to be the way to go. "Ciders and meads are both gluten-free and that is becoming a more popular trend, for lack of a better term," Beauchemin added on the subject. "Some of it is out of necessity and some people are choosing to go that direction, but some of our larger accounts are actually breweries, so people are looking for options in today's world." Stayman, Newtown Pippin and Limbertwig ciders from Good Road. Breweries, bars and restaurants that boast a wide selection of beer set aside 10, 15 or 30-plus taps full of American IPAs, German hefeweizens, Belgian witbiers and popular pilsners. Among those taps, there may be only one or two taps reserved for a cider. Sometimes, it's not Good Road or Red Clay on the list; in some cases, Angry Orchard holds the reign on the only cider tap in establishments. To fix this, Beauchemin believes education on what true cider is a good road to take. "The big guys, the Angry Orchards of the world, are a double-edged sword in that they put a ton of money into marketing, which helps get the cider world out there," he said. "But then their product is something that is watered down and back-sweetened with sugar." Watering down a cider due to using concentrate or back-sweetening it artificially with sugar is a no-no if a cider maker wants a fresh and flavorful result with a natural color. Beauchemin shared his disdain for Angry Orchard, and stated that he's seen on their bottle labels that caramel coloring is added. The watered-down nature of the cider leaves it without a light golden color, making it no longer appetizing, so the artificial coloring corrects this. "It's an education on what true cider really tastes like, in that it can be extremely flavorful, extremely diverse, with a broad array of dryness and some sweetness," Beauchemin said. "It is a product that's not manufactured. 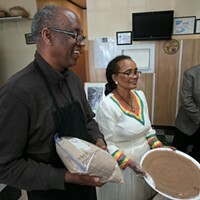 It's truly handmade in small batches, and just getting that education out to the marketplace [is important]." Cideries outside of Charlotte — and North Carolina — are starting to move into the Charlotte market, as they are recognizing the hotbed of cider activity happening in the city. "Gone are the days where it's just us and Good Road, unfortunately. Not only do we have, I think 15 or 16 cideries in North Carolina, now all these other areas of the country have looked for the next place that cider is hot and it's here — it's between here and Raleigh." It's a catch-22 for Good Road and Red Clay. Beauchemin and Bradish welcome a rise in cider's popularity in the Queen City if it means people are more interested in their craft, but across the country, larger cider makers have more resources and are starting to move into North Carolina. When Red Clay opened in 2015, Bradish experienced trouble distributing any other cider except for the sweeter stuff — The South End, which is back-sweetened with natural juice. No one in the market felt that customers would want anything dry and wine-like. But he saw a different story in his taproom. 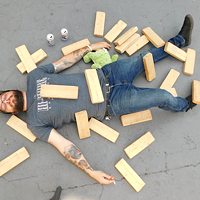 "We had a hard time placing anything but The South End in an account around Charlotte because everybody thought people only wanted something sweet and we were seeing in our taproom from day one that is not the case," Bradish stated. "We were seeing people were drinking drier and drier stuff." Beauchemin pours up some cider at Good Road. But the sweeter stuff still reigns over the drier side of cider, despite the boom in Charlotte's taste for dry hard apple cider. "No doubt, the fruited ciders are more popular and that's an industry standard, that's how it's going," he continued. "So we see the Cherry [Bobbin' Trolls], the Ginga Blue, the Holla Piña, the [Red Clay] Rosé, those are pretty much dominating keg sales off-premise. What I'm happy about the scene, is that people are going away from the sweeter stuff and more toward dry, which is what I prefer." Hard cider's non-alcoholic sibling, apple cider, is the family-friendly drink of fall. While the South shifts from the 80- and 90-degree weather to the 50s and 60s and the leaves begin to change color, both Red Clay and Good Road have the cider recipes to respond. At Red Clay, Bradish stayed true to the desire for pumpkin that falls upon the drinkers of the world and created a pumpkin chai spice cider for the fall season. On the other hand, Good Road decided to add a subtle flavor of fresh orange peel to their Waymaker ginger cider while also fermenting a maple orange blossom mead, which is a honey wine, in tandem for the holiday season. The diverse flavor profile of cider coupled with it's light mouthfeel and varying degrees of dryness and sweetness is what makes this in-between category of drink so appealing. When done right, the simple ingredients of yeast and pressed apples allow drinkers to rest assured that their cider is health-conscious, won't ruin their diets or fill them up too quickly. That's what's swinging Charlotte to be hip with the cider game, it's increasing to the same caliber of popularity as beer, so open up more taps for rotating craft ciders and don't buy the $15.99 variety pack of Angry Orchard at the grocery store. Instead, opt for the true ciders that Charlotte cider makers offer to the altar of the craft industry. You won't regret it.